Cardinal Jaime Sin, the retired leader of Philippine Catholics who inspired revolts which deposed two presidents, is being treated in a Manila hospital. Church officials said the 76-year-old cleric, who has a history of illness, was in a stable condition amid reports that he had suffered a heart attack. 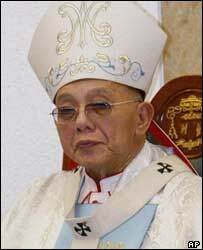 He retired last year after nearly 30 years heading the Manila Archdiocese. That period saw him playing key roles in the toppling of Ferdinand Marcos in 1986 and Joseph Estrada in 2001. "He was under sedation while doctors observed him. He was awake [this morning] and I think that is a good sign." In recent years, the cardinal has suffered a variety of health problems, including diabetes and a kidney disorder. Other reports suggested the cardinal, who commands a huge following, was on a life support machine. Father Rufino Sescon, his secretary, was quoted by Reuters news agency as saying the cardinal had suffered a "congestive heart failure". "His vital signs are normal," Father Sescon added. "We cannot yet definitely say how long will he stay in the hospital." The cardinal has always made clear he believes the Church has a duty towards politics. "My duty is to put Christ in politics," he said at his retirement ceremony in November. "Politics without Christ is the greatest scourge of our nation," he added.